Dear God I know that I'm not perfect. Home » Prayer » Dear God I know that I'm not perfect. another day to start over again. I have even so little only, again dear God thank you. Our biggest gift this thing we call life. Thanking God and living to its fullest. Here I am given this day the gift how shall embrace this gift with thank you and we'll go from there. Dear God I know that I'm not perfect. picture/image is an Inspirational Stuff to Inspire and Motivate You. You can download pics by just clicking on the Images. Thanks for visiting Truth Follower an online place for huge collection of inspiring pictures, quotation, and Sayings Images. 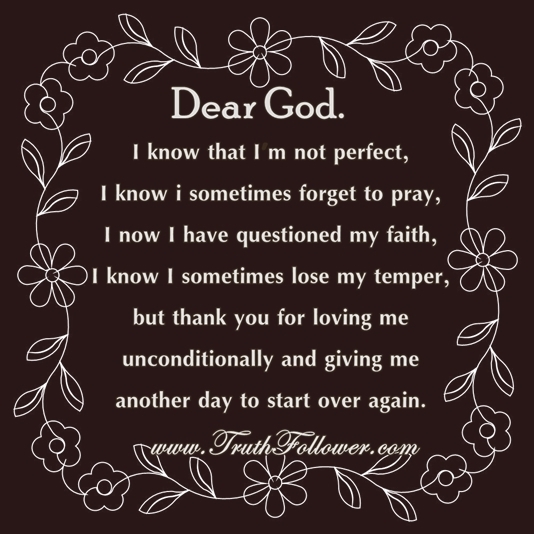 If you like Dear God I know that I'm not perfect., Please Share with friends and family on Facebook, Twitter, and Pinterest.